Negotiate up your compensation by thousands of dollars. If you have ever received a paycheck, you know how important a compensation negotiation can be. When you feel like you are being paid what you are worth, it’s a great feeling to go to work everyday. If you know that you are being paid less, work can be a drag, no matter how talented your team, or exciting your projects. Whether it’s for a promotion, or a new job, you are going to know what you are worth. You are going to set your walkaway number, and be confident that you don’t have to take less. You are going to understand how startup packages work, so you can negotiate with your salary, bonus, equity and benefits and know that you will probably be able to work with the right company for you. You are going to close the negotiation with a package you are happy with. For the last few years, I’ve been coaching and advising women in technology startups about negotiating for more compensation. My favorite story is about Jenny, a product manager in NYC who had secured a senior product management position in an SF startup. The new startup was only able to increase her base salary by $5k, but using techniques that I developed, she was able to negotiate increases in equity, a sizable relocation reimbursement, executive education credits, and a guaranteed six month review where one year was standard for the company. Her total increase in compensation was $27,000, with the opportunity to negotiate up again in six months! 63% of the time, men are offered higher salaries than women for the same role at the same company. On average these companies offer women 4% less than men for the same role, with some offering women up to 45% less. 66% of the time, women are asking for less money - 6% less on average - than men for the same role at the same company. More than half (54%) of women report they had found out they were paid less than a male peer in their same role — compared to 19% of men who reported the same experience throughout their careers. Women in tech are asking for lower salaries than men — but the expectation gap is lowest in health and finance, at 8%. E-commerce and education technology come in next at 9%, while women in tech positions in the media industry are asking for a full 10% less than men. Negotiating a salary increase has a positive cumulative effect over the course of your career, assuming you don’t agree to a pay cut at any point in the future. 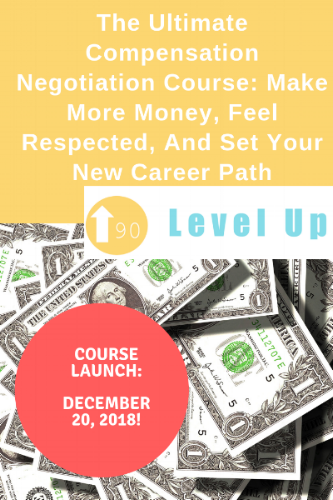 Based on interviews with hundreds of hiring mangers and recruiters, as well as my own experience negotiating over $!00M in contracts, I’ve developed a bootcamp to help you increase your compensation in your next position. The Set Your Market Value Spreadsheet - a thorough excel spreadsheet that takes you through the process of setting your compensation range. Over 30 phone and email scripts for negotiating your counteroffer, benefits, and an increase in equity. Video tutorials walking you through how employers set compensation, how to understand your market value, how to set counteroffer, and how to close a job offer. The Evaluate Your Offer Spreadsheet - a systematic way to evaluate each offer and produce a counter-offer that is consistent with your market rate and preferences. The Ultimate Negotiation Pack - an quick reference guide to the most common scenarios and questions as you go through the interview and negotiation processes. When the course launches on December 20, the price will be $200. By buy on a pre-sale, you’ll be saving 50% of your cost, and you will also have instant access to the first lesson and the Salary Negotiation Spreadsheet. These resources are specifically for women in tech startups, so it’s custom tailored to what your job offer will probably look like! Try out a Free sample lesson! Not sure about a pre-sale, but want to know when the course launches? Join our waitlist, and we’ll keep you updated! Thank you! We’ll let you know as soon as the course is launched. In the meantime, check your inbox (or spam folder) access to our resource library full of negotiation resources. *Joining the waitlist also gives you access to our resource library, full of negotiation tips and resources!